Molten salt reactors have the potential to produce carbon free energy that is cheaper than coal. And they can produce that energy in a very safe and clean way. In short, they have properties that make them the potential game changer in our energy landscape. MSR’s energy production figures are remarkable. This clearly shows in their ERoEI, or Energy Returned on Energy Invested. According to Wikipedia ERoEI is the ratio of the amount of usable energy acquired from a particular energy resource to the amount of energy expended to obtain that energy resource. For instance for solar panels (photovoltaic) this is roughly 10: for 1 kWh invested in solar, you get back 10 kWh of usable energy. For wind, this is about 20. For coal, this about 40*). For a mid-size Dual Fluid Reactor (one of the MSR-options) it is about 1200**). Another example may help to clarify the energy potential. Say you would have to produce the electricity for a modern city of a million inhabitants. This means you’d have to produce roughly one gigawatt-year of electrical power (GWye). To do this in a coal power plant you would need about 570 kilometers of freight train, filled with coal: 1,5 kilometer daily. To produce the same amount in an MSR-powered plant, you would need about one tonne (1000 kgs) of metal, either thorium, uranium or plutonium – depending on the reactor you choose. To produce the electricity for an Amsterdam sized city for a year with a molten salt reactor, you would need around one tonne of metal – either thorium or uranium. 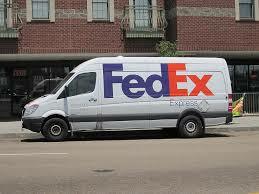 This could be transported in a delivery van like the one FedEx uses to bring you a new pair of shoes. Although present-day nuclear reactors are ill-reputed for producing waste, the the more relevant comparison is the waste produced by a coal power plant. The GWy-plant in the example above, transforms the one-year-coal supply, 570 kilometers of freight train, into 57 kilometers freight train full of fly ash (containing arcenic, cadmium, lead, mercury, thorium and uranium) and of course 9 million tonnes of carbon dioxide. For the production of the same amount of electricity, an MSR produces roughly one tonne of nuclear waste. This waste consists of fission products, and needs to be safely stored for about 300 years. Then it can be safely returned to the earth – the remains are just as safe as the stuff you took out in the first place. Although you don’t have to return it, most of it is very usable stuff once the radiation is gone. Compared to a coal plant, even a present day nuclear reactor is very clean. To produce the same GWye in a present day nuclear reactor, 250 tonnes of natural uranium is used. After enrichment, we have 215 tonnes of depleted uranium and 35 tonnes of enriched uranium. After using the enriched uranium in the reactor, 35 tonnes of spent nuclear fuel remain, of which one tonne is the nasty stuff that needs to be stored for 10.000 – 100.000 years. The good news is that once MSR’s come online, they can fully use this waste tail of present day reactors. Meaning that our GWye MSR can keep going for about 250 years of a single year’s ‘waste’ of a present day nuclear reactor. If you would produce that same GWye for Amsterdam in a coal plant, you would have to order 570 kilometers of freight train full of coal (3.3 million tonnes). This will produce 9 million tonnes of carbon dioxide. You will have to dispose 330.000 tonnes of fly ash. In this ash, there’s enough thorium and uranium to keep our MSR going for at least 20 years. 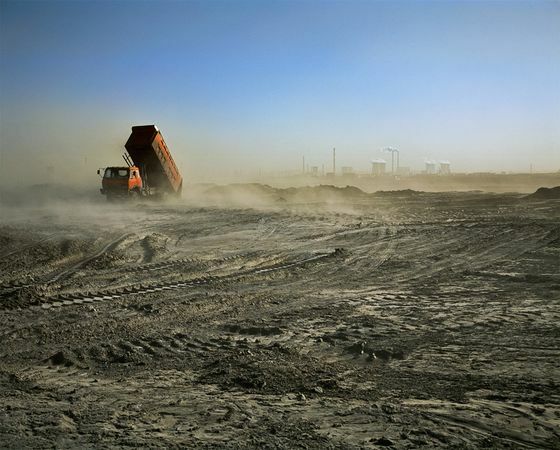 The – largely ignored issue of – heavy metal wastes in coal ash, like cadmium, mercury, lead (and thorium and uranium) are ever lasting. And, of course, an MSR does not produce any carbon dioxide. The picture comes from www.thinkglobalgreen.org. The biggest risk for conventional reactors is the melting of their core. Molten salt reactors have a core that is already melted, and that’s what they’re built for. MSR’s are not under pressure, there’s no risk of explosion – there is simply nothing that can explode. In essence, an MSR is a strong vessel filled with a hot liquid, that heats itself by a nuclear reaction. If you use the heat, for instance for producing electricity, the liquid cools. This slows the nuclei, brings them closer to each other and the nuclear reaction intensifies. If electricity production stops, the fuel heats and the nuclei start moving faster and get further away from each other and this slows the reaction or even stops it. This so called ‘negative temperature coefficient’ also means that the reactor is ‘load following’. This makes it very easy to operate, even without control rods. Once the nuclear reaction is going, each fission produces fission products. These are radioactive elements, the spreading of which should be prevented at all times. In the case of a molten salt reactor, these elements are ionically bonded within the molten salt. In other words: the fission products are safely contained within the salt mixture and even if something should happen to the reactor vessel, there is no spreading mechanism that wil drive the fission products out of the containment. In case the fluid leaks, it safely drains into storage tanks. The shut-down procedure of most molten salt reactors is based on melting a so called ‘freeze plug’, allowing the liquid nuclear fuel to drain safely into subcritical storage tanks. In Oak Ridge in the 1960′s, this procedure proved to work so elegantly and easily, that it became the standard procedure to shut down the reactor at fridays, when everybody wanted to go home for the weekend. This picture, taken from above, probably around 1965 does not show the plug. The risk of spreading nuclear materials that could be used for making nuclear bombs is called the proliferation risk. Molten salt reactors can be made in very different ways, there’s an endlest list of options that all have one thing in common: the core is a molten salt. The design can be optimized for a whole range of aspects, the proliferation resistance being one of them. In Oak Ridge National Laboratory, after the Molten Salt Reactor Experiment was ended in 1969, the research focussed on designing for safety, especially proliferation safety. On the internet, you may have come across claims that ‘because these reactors use thorium, they are proliferation resistant’. That is putting things a bit too easy. It would be more accurate to say that molten salt reactor designers can use several properties to ensure the safety and optimize on proliferation resistance. Probably the most important of these is based on the fact that molten salt reactors are able to keep their fuel in optimal condition at all times and use their fuel very efficiently. These allow them to run on very low fuel inventories: unlike in conventional reactors, there is no surplus fuel present. 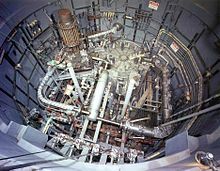 This means that any attempt to remove fissile material from the core – in the unlikely event that outsiders get access to the reactor and know how to handle its remote controlls – will result in instant power loss. Such an event is very easy to monitor, even from a remote location. Another option to prevent bad guys from making weapons from reactor materials is to use mixtures that are no good for making bombs and are difficult and/or dangerous to handle. Another is to make a modular plant with a closed core that never needs to be opened at the plant location – this is the option that Terrestrial Energy is persuing. These options can be combined with others, making it virtually impossible to abuse the nuclear content of the core. In short, there are excellent technical solutions for optimizing reactor safety, to which of course are added the more regular protection and safety measures, like those taken for just about any type of facility that does not allow the presence of unautorized personell. To put proliferation risks in perspective, the question that needs to be asked is: does msr thechnology make it easier for nations to produce nuclear weapons material? Nations that have set themselves in the past to get access to such materials, have never had trouble to get that access. Over the last centuries, fossil fuels have proven to be a major factor in world politics. Dependency on oil of the industrialised countries has strongly contributed to the survival of illegitimate regimes in many parts of the world. Molten salt reactors offer the perspective of energy independence. The fact that not every country has abundant resources in uranium or thorium is irrelevant: a strategic supply of molten salt reactor fuel is small, easy to obtain and easy to store. For most countries, the inventory neccessary for year of energy production can be transported in a single barge: see the ‘numbers’ pages. 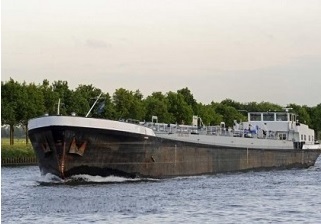 This 2736 tonnes river barge will do: it could transport a strategic fuel load, that could supply most countries with abundant energy for many years. Provided this country uses molten salt reactors to supply their power. *) EROI’s for similar energy sources can be quite different. The sources mentioned before the asterisk *) come from wikipedia: http://en.wikipedia.org/wiki/Energy_returned_on_energy_invested. In a 2015 study of Bhandari et al., a total of 232 references for photovoltaics (PV) performance were collected of which 23 passed. The researchers found that the EROEI varied from 8.7 to 34.2. The difference whas not so much in the efficiency of the panels but in the more than 10-fold variation due to the variation in BOS embedded energy, geographical location and LCA data sources. **) The EROI of 1200 is based on the estimates of the designers of the DFR. According to the authors these estimates are conservative and leave room for further improvement. Here’s more on the DFR.